We provide a full-suite of IT products & services. Since 1994, Ananke ("ah-nang'-kee") has grown by providing reliable, high-quality IT services to some of the largest companies in the world. As a branch of our Managed Services, Ananke offers Small Business Services and Web Design Solutions, along with our Staffing and Professional Services. 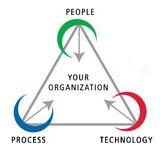 Ananke is committed to the fundamental principles which make up our organization: People, Process, and Technology. Each component on its own is a significant asset to any company, but when strategically brought together, the outcome is remarkable. The time to move toward sustainability is now. Concerns about the economy coupled with unpredictable energy prices are increasing pressure to bring operating costs down. Meanwhile, unprecedented public awareness of environmental issues means there's a "social dividend" to be gained by companies that go green, including being able to attract great talent. Use Microsoft’s Sustainability Calculators to estimate your company's carbon footprint and see the savings you can achieve through enlightened IT implementation. Ananke will give your company a unique and professional presence on the internet. We can create a web site based on your business needs and have your web site up and running in as little as two weeks. Ananke designs your web site and offer hosting and maintenance plans. Ananke IT Solutions provides online computer repair for frustrating computer problems. We have a team of experienced professionals armed with the latest computer problem solving technology. Our Engineers securely connect to your computer over the Internet and solve the problem while you sit back and watch. No need to pack up your computer and lug it into a local computer repair shop or schedule time for a tech to come to your house..
04/06/2010 Ananke provides professional data recovery and restoration services for disasters of all types and sizes, including: Flood / Water Damage, Power Related Problems, Hardware Failure, Fire / Heat / Smoke Damage, Virus Damage, and Human Error. Ananke delivers fast and reliable data recovery services for storage media used in virtually all computers systems, portable devices, and operating environments. Call Ananke Support 401.808.8470 or 401.808.8453 or email us at support@ananke.com. 03/15/2010 Massachusetts put the most rigorous Identity Protection Compliance Law in the US into effect March 1st. This directly impacts every organization in Massachusetts AND every organization that does business with any (regardless of where they are located) organization in Massachusetts OR has personal identity information on any person from or in Massachusetts (i.e. name, phone number, address, etc.). Out of compliance? A civil penalty of $5,000 may be levied for each violation of M.G.L. 93H 201 CMR 17.00. In addition, under the portion of M.G.L. 93I concerning data disposal, businesses can be subject to a fine of up to $50,000 for each instance of improper disposal. Call today to make sure your business is in compliance at 401-331-2780 or email support@ananke.com.